Funnysearching.com is the PUP that uses misleading techniques to prevent removal. Use Reimage to locate malicious components and get rid of them faster than with uninstall instructions. A full system scan blocks virus reappearance and prevents traffic to malicious domains. 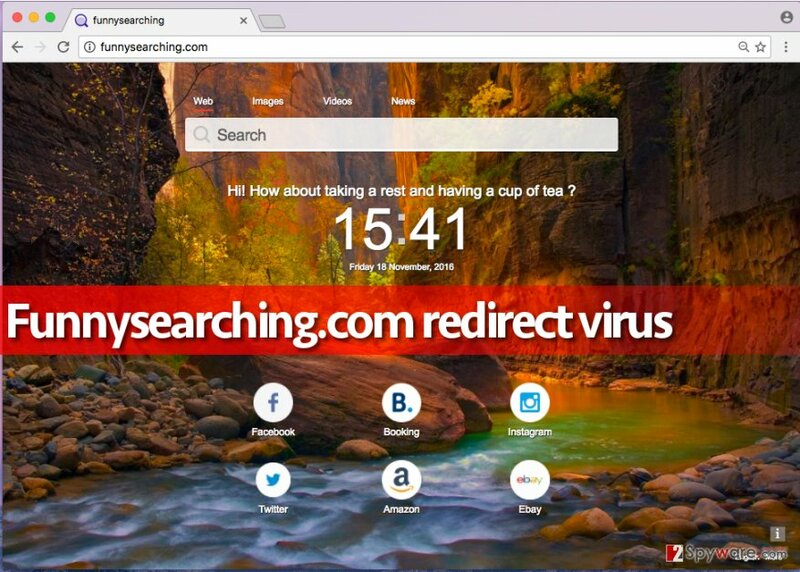 Though this hijacker may not be as persistent as a typical browser hijacker, it surely disturbs your browsing sessions. 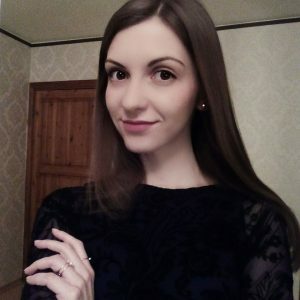 Specifically, it starts monitoring your activity online, finds out what websites you frequently visit, what do you search for online, what ads do you click on and so on. It mainly looks for information that reveals your interests; later on, it uses such information to generate more relevant ads. These advertisements are then integrated into search results every time you attempt to search the web via Funnysearching.com search engine. However, you should not trust this search tool, because soon enough you might find out that such searching practice isn’, and cannot be funny at all. The browser hijacker that controls it is sometimes called Funnysearching.com redirect virus, and it got this label, not without reason. As you probably have understood, clicking on search results brought by this search engine can redirect you to highly suspicious websites, and pose a risk to your computer system. Typical browser hijackers are made to promote third-party partners and their websites, so search tools they present to users hardly focus on the quality of the search results. As a result, results might contain dangerous links, which you should never click on. To avoid potential risks, we suggest you remove Funnysearching.com hijacker as soon as you can and learn how to install free software safely to avoid browser hijacks. Reimage or Plumbytes Anti-MalwareMalwarebytes Malwarebytes does it for you faster. For successful Funnysearching.com removal, use an anti-spyware tool or use guidelines provided below the post. If you cannot understand these instructions, ask somebody to help you or send your questions to our support team. 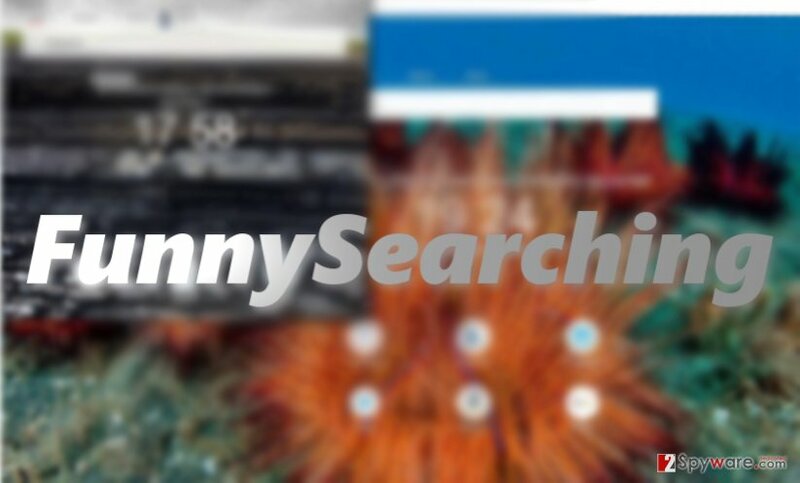 Funnysearching.com keeps changing its veneer. Browser hijackers, just like computer viruses, seek to infect the computer system unnoticeably. However, unlike the majority of viruses, they show signs of existence as soon as they get installed – computer user notices changes that browser hijackers initiate right after opening any web browser. To facilitate Funnysearching.com hijack the computer system, computer user only needs to install a program that contains it using default or standard installation settings. To stop browser hijackers and other potentially unwanted programs before they enter your computer system, choose Custom/Advanced settings whenever you download a new program to your PC. These settings generally present some ads asking to install related third-party software or simply some ostensibly useful pieces of software that allegedly can improve user’s browsing experience or improve computer’s performance. It is highly recommended to decline such offers. You only have to deselect suggestions to add “recommended” software to your system. If your computer has been affected by this browser hijacker, you should notice that it functions slower than usual and that your web browser fails to respond sometimes. It might be Funnysearching.com virus’ fault, so you should not let this program stay in the system for any longer. Luckily, programs like this hijacker can be removed manually, although it is easier to delete them automatically. For manual Funnysearching.com removal, scroll down to see and follow instructions that our team has prepared. For automatic removal, install and run a decent anti-malware software. Note that this bnrowser infection targets all users, eghether you live in Hungary or the US. Find and remove suspicious applications as well as browser extensions from the system with a help of the guide provided below. You should be looking for Funny Searching or similarly named files to remove. Here, look for Funnysearching.com or any other recently installed suspicious programs. Wait until you see Applications folder and look for Funnysearching.com or any other suspicious programs on it. Now right click on every of such entries and select Move to Trash. When in the new window, check Delete personal settings and select Reset again to complete Funnysearching.com removal. Once these steps are finished, Funnysearching.com should be removed from your Microsoft Edge browser. Here, select Funnysearching.com and other questionable plugins. Click Remove to delete these entries. Now you will see Reset Firefox to its default state message with Reset Firefox button. Click this button for several times and complete Funnysearching.com removal. Here, select Funnysearching.com and other malicious plugins and select trash icon to delete these entries. Click Reset to confirm this action and complete Funnysearching.com removal. Here, select Extensions and look for Funnysearching.com or other suspicious entries. Click on the Uninstall button to get rid each of them. Here, look at the Homepage field. If it was altered by Funnysearching.com, remove unwanted link and enter the one that you want to use for your searches. Remember to include the "http://" before typing in the address of the page. Now you will see a detailed dialog window filled with reset options. All of those options are usually checked, but you can specify which of them you want to reset. Click the Reset button to complete Funnysearching.com removal process. ^ Barry W Stanton . Do Pop-Up Ads Really Work?. Gazette Review. Your Source for Todays' News. ^ AccuWeather app shared users' location data. BBC News. ^ Eliminate computer threats. Avirus. Spyware and IT news in Hungarian. This entry was posted on 2017-08-25 at 03:08 and is filed under Stealing programs, Viruses. You can quickly scan the QR code with your mobile device and have Funnysearching.com virus manual removal instructions right in your pocket. How did you remove Funnysearching.com virus?